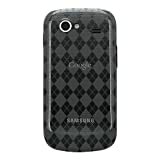 Reinforced Luxe Argyle High Gloss TPU Soft Gel Skin Case – more fashionable and durable case from Amzer. Perfect match for your Samsung/Google Nexus S to protect against scratches and minor bumps. Special anti-dust and scratch-free properties, preserves your Samsung/Google Nexus S shining look. Provides extra grip and traction on angled surfaces and prevent your Samsung/Google Nexus S from sliding on soft surfaces or angle surfaces. Designed perfectly to conform to your Google Nexus S’s design.